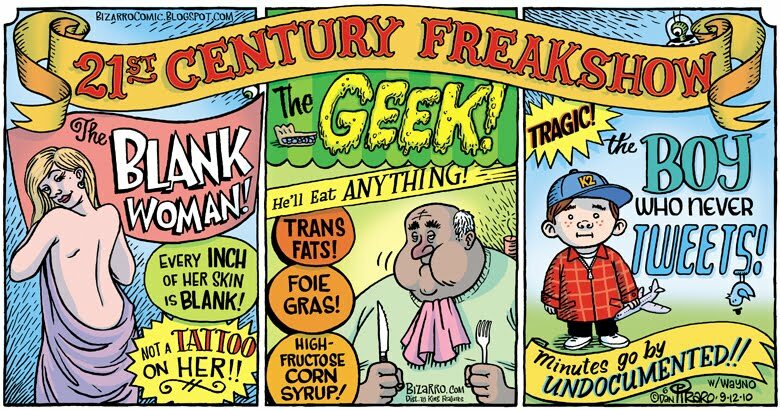 Bizarro rides again: Take a look at this 21st Century Freakshow! Are you normal? Then see your doctor immediately! Last week I wrote about Bizarro’s wonderfully perceptive cartoon on switching off your brain cells. This is another one from this sharp-shooting Bizarro creator. I don’t need to say anything more — the cartoon speaks for itself. In admiration and awe, all I can say is: I wish I’d thought of these first! 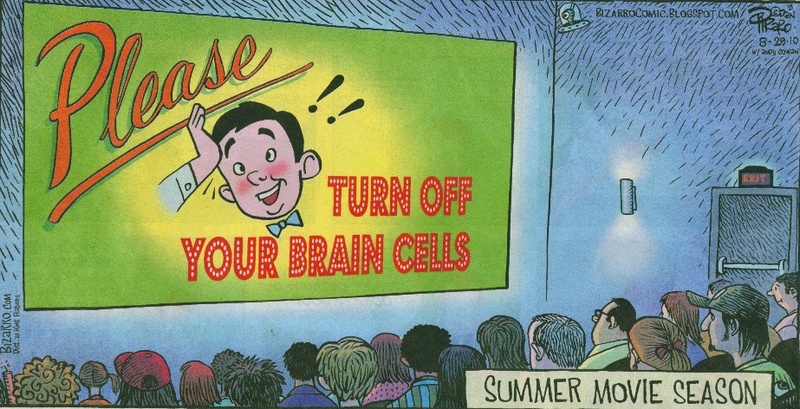 Bizarro: Turn off your brain cells before the screening! We’re all familiar with the request at cinemas, theatres and concert halls for everyone to turn off their cell phones (a.k.a. mobiles) before the show starts. Not that everyone complies — there are enough deviants among us who just can’t disengage themselves from their electronic leashes even for a couple of hours. But here’s a new twist to that common (and much needed) request: I came across this in the Bizarro cartoon, which offers some fascinating insights into our topsy turvy times. There are times when I feel that every TV set should come with this line printed on top! Everyone has a story about cell phones going off at the wrong time in the wrong place. Here’s my favourite. Together with my TVEAP team, I was running the 2004 AIDS Film Festival in Bangkok, Thailand, during the 15th International AIDS Conference, in July 2004. The festival was held across three venues, and showcased over 50 film titles from around the world — we had nearly half the film makers turning up in person to be introduce their films. One such film maker, an academic turned film maker, was eagerly talking about his film (an excellent one, unusual for academics) when somebody’s cell phone went off. But the cell phone ring continued, getting louder. It took a full minute for its owner to be found — who turned out to be our speaker himself! His own cell phone had been ringing in his trouser pocket all this time, disrupting his own talk. Moral of the story: Turn off your cell phone at a public performance, especially if it’s your own performance! It’s funny how, more than a generation after most of the world adopted the metric system of measurements, relics of the earlier, ‘imperial’ units still linger in our language and popular culture. Frequent flyers stlll accumulate air-miles, not kilometres. Disaster managers grapple with the challenges of communicating credible early warnings on that the crucial ‘last mile’ (it’s not yet the ‘last kilometre’). And many among us, including those who have grown up in a metric world, can better grasp a square mile than a square kilometre. According to Robert, One Square Mile takes the lid off a neighbourhood. Reporters wander around a marked out section of a town and city and talk to the people they meet to find out what their everyday concerns are. Of this months shows, two are presented by Zeinab Badawi . In one, she goes walkabout in Juba, capital of south Sudan which is on the verge of becoming an independent state. In the other, Badawi encounters murder on the streets in Guatemala City. The other two are presented by my friend Vasanthi Hariprakash, whose day job is with India’s leading TV news network NDTV. These two are of particular interest to me as she travels to countries in Asia that are closer to me in distance and closer to my heart. 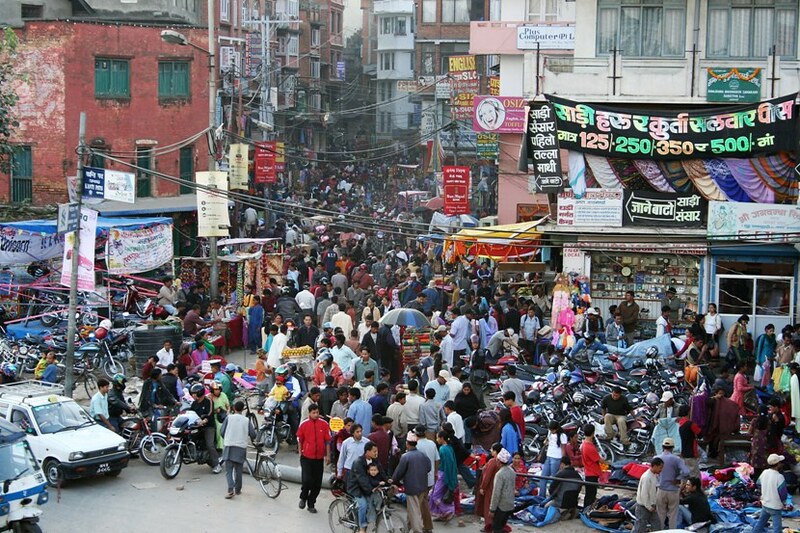 I’m familiar with that city having made multiple visits since 1995, and have shared the pains and anxieties of my Nepali friends as they went through political turmoil and a bloody insurgency. I saluted them when their ‘people power’ got rid of the despotic king in 2006. I can’t wait for more real-life stories in One Square Mile, and I hope Robert Lamb will send out his intrepid and charming reporters to far corners of the real world where real people are taking on life’s many challenges 24/7. These people’s resilience and resourcefulness inspire us all. And that’s what good television is all about. Moving images, moving us all!